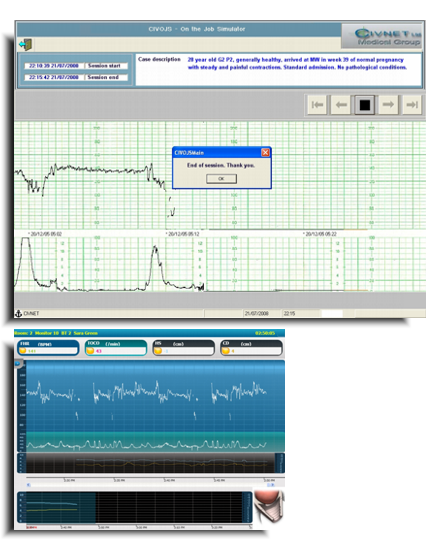 CIV-OJS was designed to facilitate practice for the medical, nursing, and birthing team, based on genuine monitor data selected from the real monitoring archive for training purposes. CIV OJS provides true event simulations in a natural work environment, helping the obstetric staff learn how to professionally identify suspicious monitor readings. Organizations use CIV-OJS to build structured curricula for trainees to study methods of diagnosis that comply with departmental norms and organizational guidelines. CIV OJS helps department managers implement norms for treating suspicious monitor readings, improve medical care, and reduce the risk of misdiagnosed events.